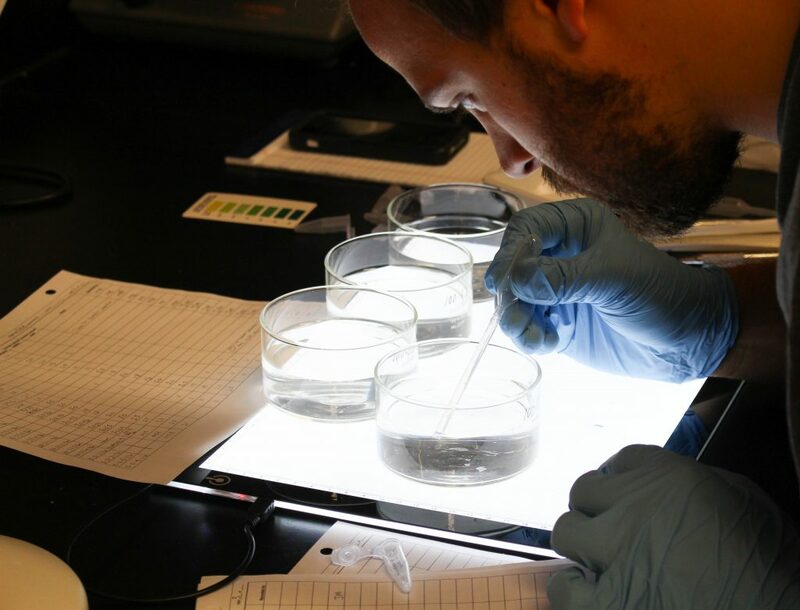 Researchers conducted laboratory experiments on mahi-mahi embryos to determine the effects of ultraviolet radiation (UV) and oil co-exposure during different times in their development. The team observed that UV affected the success of mahi-mahi hatch in all exposure scenarios compared to controls but was highest (a 1.6- to 6-fold increase) when co-exposure occurred late in embryonic development. Co-exposure with weathered surface oil reduced heart rate in hatched larvae. The results suggest that the developmental window when co-exposure occurs may affect the degree of oil toxicity and exacerbate cardiac effects in developing fish. The researchers published their findings in Environmental Toxicology and Chemistry: Exposure to ultraviolet radiation late in development increases the toxicity of oil to mahi-mahi (Coryphaena hippurus) embryos. Exposure trials used varying concentrations of high-energy water accommodated fractions (HEWAFs) for Macondo source oil and weathered oil from skimming operations. Roberts explained that the dose concentrations of naturally weathered surface oil (10?g/L) was within the range of concentrations reported during the spill (0 – 84?g/L; Diercks et al., 2010) and similar to previous NRDA-sponsored work (Alloy et al., 2016, 2017). Dose concentrations for source oil were higher, because oil had not undergone weathering, and ranged from 4.5-29ug/L. Following UV and oil exposure, the researchers documented the number of alive and dead embryos and larvae to quantify hatching success and filmed embryos exposed to surface oil to quantify heart rate. “Interestingly, this period of sensitivity late in development coincides with dramatic changes in their physiology that may contribute to this sensitivity, such as changes in buoyancy, metabolic rate, and yolk sac depletion,” explained Roberts. “Taken together, these data suggest that pelagic fish embryos are more sensitive to oil just prior to hatch.” The researchers note that future work is necessary to better understand the extent of late-development UV exposure cardiac dysfunction and cardiac-independent deformities. Data are publicly available through the Gulf of Mexico Research Initiative Information & Data Cooperative (GRIIDC) at doi:10.7266/N7JH3J60. The study’s authors are Lauren E. Sweet, Jason Magnuson, T. Ross Garner, Matthew M. Alloy, John D. Stieglitz, Daniel Benetti, Martin Grosell, and Aaron P. Roberts. This research was made possible in part by a grant from the Gulf of Mexico Research Initiative (GoMRI) to the Relationship of Effects of Cardiac Outcomes in Fish for Validation of Ecological Risk (RECOVER)consortium.